Elected officials in Idaho won't mellow the state's pot laws. Can an initiative change that? It was a cold, blustery day in Coeur d'Alene when Orenda Peterson headed out to a food truck rally, carrying a small stack of papers that she and others hope will bring a new approach to marijuana in Idaho. The gloves Peterson was wearing made it tricky to handle the signature sheets, and after standing in the chilly wind for about a half-hour, she had 10 signatures for an initiative petition to loosen the state's stringent pot laws. It was a small step toward her personal goal of getting a thousand signatures, and the 10,000 signatures she and volunteers are aiming for in Kootenai County. Statewide, supporters of the initiative face similarly high bars. 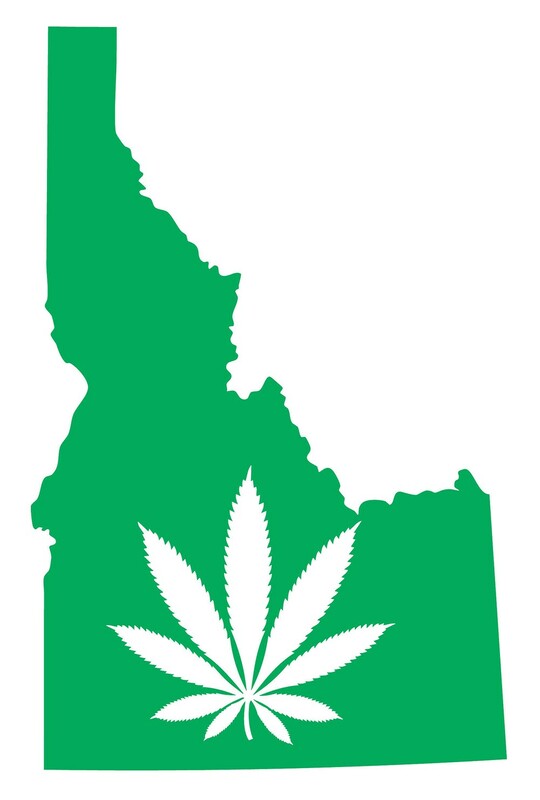 Earlier this month, the Idaho Secretary of State's Office approved an initiative petition sponsored by New Approach Idaho, a network of pro-pot activists. If supporters collect enough signatures to get it on the ballot and convince voters it's a good idea, it would decriminalize possession of pot in Idaho and sanction its use for medical purposes. The clearest path to changing the Gem State's pot laws goes through the initiative process, with state elected officials making it clear that change wouldn't come from them. Last week, Gov. Butch Otter vetoed a carefully crafted bill that would have allowed parents of children experiencing severe seizures to use cannabidiol oil (CBD), a marijuana byproduct that contains virtually no THC, the plant's psychoactive substance, and has shown some promise in treating epilepsy. There are signs of public support for medical pot in Idaho, and other conservative states have shown a willingness to loosen their laws surrounding the drug. But while the initiative process may be the clearest path for changing the Gem State's pot laws, it's still a path full of institutional, financial and cultural barriers. Idaho and Wyoming are the only two Western states (Utah allows for medical use of CBD oil) that don't allow any medical use of the plant. In Idaho, those caught with up to three ounces of marijuana can face up to a year in jail, a $1,000 fine and a misdemeanor record. For more than three ounces, it's a felony conviction that can carry a five-year jail sentence and a $10,000 fine. Bill Esbensen, spokesman for New Approach Idaho, is seeking to change that. The group's initiative would legalize medical marijuana and bump possession down to an infraction, meaning those caught would likely just get a ticket. In the past, activists have tried to legalize marijuana and saw their efforts go up in smoke. In 2014, Compassionate Idaho, a group seeking to legalize medical pot in the state, had so few signatures that they didn't even turn in their sheets for verification. Esbensen says New Approach Idaho (which borrows its name from the campaigns that legalized pot in Oregon and Washington) is different. "This isn't a bunch of hippies you are dealing with," says Esbensen. New Approach Idaho, he says, is more organized, is raising money and has 280 volunteers who will seek 47,623 valid signatures, including a minimum of 6 percent of voters in at least 18 of the state's legislative districts, by April 2016. If they're successful, the measure will appear on the November 2016 ballot. Although a poll released earlier this year by Idaho Politics Weekly found that a majority of Idahoans oppose legalizing pot outright, polls from 2010 and 2011 show majorities supporting medical pot. But despite apparent public support, New Approach Idaho is facing an uphill battle. According to Gary Moncrief, a professor of political science at Boise State University, the threshold to qualify initiatives is higher than in states such as Oregon. Since 2000, a total of five initiatives have appeared on the Idaho ballot. In 2013, according to Moncrief, the legislature raised the bar even higher by requiring valid signatures from 6 percent of the voting population in 18 of the state's 35 legislative districts, meaning that New Approach Idaho will have to convince voters in more conservative rural areas to sign on. Campaigns to legalize marijuana in states like Oregon and Alaska were heavily funded by out-of-state groups, such as the Washington, D.C.-based Marijuana Policy Project. Morgan Fox, the project's communications manager, wouldn't comment on the viability of the Idaho initiative, but did say it wouldn't be included in the states his organization will be focusing on in 2016. "We just have limited resources and can only focus in so many places," says Fox. Esbensen isn't worried about money. He estimates it'll cost half a million dollars to qualify the initiative for the ballot and another half-million to pass it, which he says will make it the cheapest marijuana initiative to ever be passed. He also says he's had meetings with out-of-state groups interested in paying for something that's been key to getting pot-related initiatives passed elsewhere: paid signature gatherers. Deeply held opposition to pot among segments of Idaho's population, particularly law enforcement, has hampered past legalization efforts. Esbensen says that during the previous medical marijuana legalization campaign, supporters had Child Protective Services called on them and experienced harassment from police. Undeterred, New Approach Idaho held its kickoff in Moscow on April 18, two days before 4/20. On that one day, says Esbensen, the campaign collected about 1,000 signatures from people in 16 different countries and raised $1,500. With a year left to collect signatures, Esbensen is optimistic they'll pull it off.